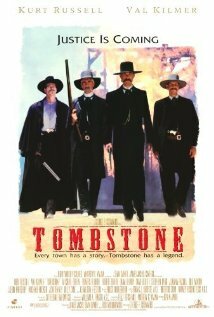 Buy or Rent Tombstone (1993) Movie DVD & BluRay Online! Movie Plot: After success cleaning up Dodge City, Wyatt Earp moves to Tombstone, Arizona, and wishes to get rich in obscurity. He meets his brothers there, as well as his old friend Doc Holliday. A band of outlaws that call themselves The Cowboys are causing problems in the region with various acts of random violence, and inevitably come into confrontation with Holliday and the Earps, which leads to a shoot-out at the OK Corral.